Tiled site layout is a current favorite with brands as we have seen with Pepsi, Chennai Super Kings and a few others. 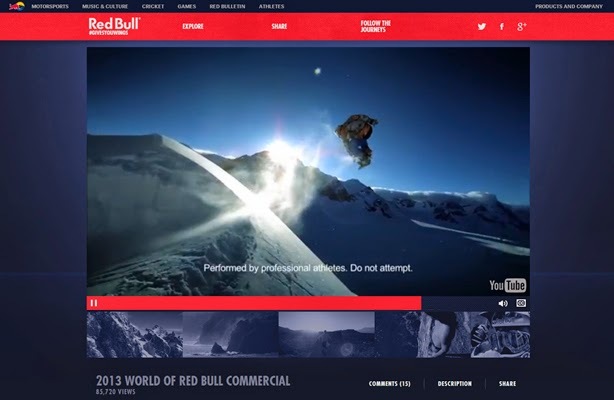 Red Bull takes the design to a whole new level with great UI, amazing animation and brilliant content. The ‘Gives You Wings’ campaign has been feted through last year including the hair-raising Felix Baumgartner stratos feat. By the way, the stratosphere jump video has clocked more than 34million views on YouTube. The event and tough prep are covered on the website in the ‘Born to Fly' section. The ‘Red Bull: Gives You Wings’ campaign continues with stories of heroism, adventure and initiatives that the brand is associated with, including the Red Bull Music Academy and Motorsports. The website covers each of these through detailed features. Fans can also be involved and share their inspiring experiences with the hashtag #givesyouwings. The India site borrows international content with minimal localization. Eventually, what really stands-out, is the excellent user interface, full screen visual experience including brilliant illustrations, imagery, videos and transitions and of course first-rate exclusive content developed for the web. This is an absolute must visit site for web designers and content creators.